This week I was privileged to work with the strong up and coming U8 team, who put in an outstanding performance today! From when the whistle blew it was clear that Copthorne were the stronger side, scoring first from their centre pass with a super goal from Rachel! The defenders Priya and Anna then turned over BHHS centre pass, which Copthorne converted from, with a great goal from Jasmine, putting them 2-0 up! Copthorne’s fast passing; well timed interceptions and strong shooting continued throughout the match, and they completely dominated the court and play, so much so that they won the match 10-1, with Rachel scoring 7 goals and Jasmine 3! As the U8s performed so well today, changes were made throughout the match allowing some girls the opportunity to try out different and new positions. It was lovely to watch the girls play together today as a team and to see how far they have come and matured this season! All of the girls were superb but a special mention must be said to Tianna and Rachel who were both my POM today for their sheer determination and feistiness throughout the match, and an extra well done to Tianna who was also picked by BHHS as their player of the match too! 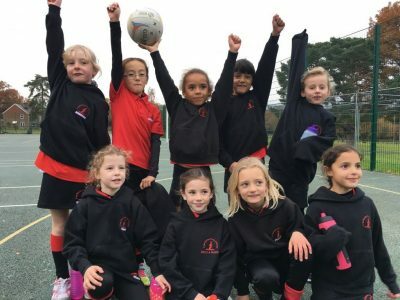 I look forward to seeing this strong U8 team develop as they progress further next term with their netball! Tianna, Rachel, Anna, Jasmine, Pippa, Bella, Jennifer, Priya and Ruby.